This hospital gel mattress incorporates a series of gel bladders encapsulated between medical grade hd- polyurethane. The gel bladders are redesigned to redirect pressure from the patient. The gel mattress is commonly used in hospitals as the first line of defense for pressure wounds and bed sores. This hospital gel mattress has a special friction proof cover that is waterproof, removable, and washable. Corner straps secure the mattress so it can be used from an elevated position. The gel bladders are evenly divided to prevent "pooling" and patient migration. 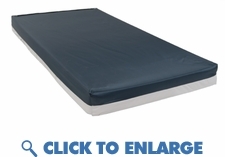 This hospital gel mattress is 3.5" thick and can go over a twin size bed or standard medical bed frame. Once piece construction requires no assembly. Supports up 300 lbs 1 year warranty. 34" WIDTH X 78" LENGTH X 3.5" Standard hospital gel mattress 3.5" thick MADE IN THE USA! This hospital gel mattress incorporates a series of gel bladders encapsulated between medical grade hd- polyurethane. The gel bladders are redesigned to redirect pressure from the patient. The gel mattress is commonly used in hospitals as the first line of defense for pressure wounds and bed sores. This hospital gel mattress is 3.5" thick and can go over a twin size bed or standard medical bed frame. Once piece construction requires no assembly. Supports up 300 lbs 1 year warranty. 34" WIDTH X 78" LENGTH X 3.5"
34" WIDTH X 78" LENGTH X 3"